Despite being a Jones, the parents of my great, great grandfather did not prove very hard to trace. The middle name of William Taylor Jones acted as a marker, so I could trace him in the censuses finding him in 1851, aged 7, with his parents George Jones and Hannah at 29 Spring Street, Birmingham. 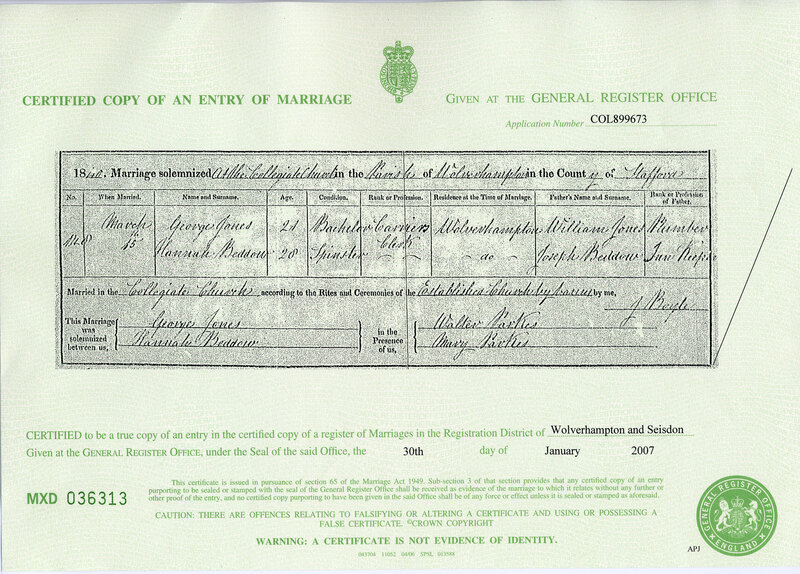 William’s birth certificate names his mother as Hannah Jones formerly Beddow. The census indicates Hannah was born ca. 1812 in Wednesbury, Staffordshire. Hannah and George are recorded on the 1841 census at Bridge Street, Wednesbury in the household of Joseph Beddow, which also includes Mary Parkes. Joseph’s occupation is not recorded on the census, but he is listed as the proprietor of the White Horse, High Street in the 1842 edition of Pigot’s Directory. The Taylor name was passed on to two more descendants that I know of, but this time down the Jones male line to a son and a grandson of William Taylor Jones. Census 1851. England. Warwickshire, Birmingham St Thomas. District 23, image no 20. Jones, George, digital image. Accessed http://www.ancestry.co.uk ,11 Mar 2013; citing The National Archives, Kew, HO 107/2052/691/1. General Register Office, Birth Certificate, Warwick, Birmingham, St Thomas. Jones,William Taylor. 1843/11/24. no 471. image of register. issued 11 August 2005. Census. 1841. England, Staffordshire, Wednesbury, District 13, image 7. Beddow, Joseph. digital image. Accessed http://www.ancestry.co.uk, 1 March 2013; citing The National Archives, Kew. HO 107/984/4/24-25/11-12. Pigot & Co.’s Royal National and Commercial Directory and Topography (London, J Pigot & Co., November 1842), Staffordshire, Wednesbury, Inns & Public Houses. p. 89. FamilySearch, England, Marriages, 1538–1973, database, FamilySearch (https://familysearch.org/pal:/MM9.1.1/NV2R-BJT : accessed 11 Mar 2013), Beddow ,Joseph &Taylor, Elizabeth, 1792/05/07; citing Family History Library film no 421615. Baptisms, marriages and burials, 1776-1812.; citing Church of England. Bishop’s transcripts. St Bartholomew, Wednesbury (Staffordshire). FamilySearch, England, Births and Christenings, 1538-1975, database. query Father Name: joseph beddow, Mother Name: Elizabeth, County: Staffordshire. I have a couple of ancestors that I believe their middle name may be a family name. I haven’t been able to track those yet. Naming traditions can be a useful clue. Good luck with finding yours!